What do prominent commentators say on key topics? Sometimes you want to look up information that’s not classical think tank research (quite yet), but may still relate to public policy. Say you want a broader take on cycling in cities. Think tanks go deep, but sometimes you want people to go fast, or broad. For this purpose, we have a search page that focuses on wonks – people that follow policy and publish regularly. Search results below. The outlets we cover, in random order: Washington Monthly, Vox (including Ezra Klein, Matt Yglesias), Andrew Sullivan, New Republic, Kevin Drum/Mother Jones, Atlantic Monthly, Tyler Cowen, The American Interest, Slate, Jonathan Chait/NY Magazine, Brad De Long, FiveThirtyEight and the New America Foundation. 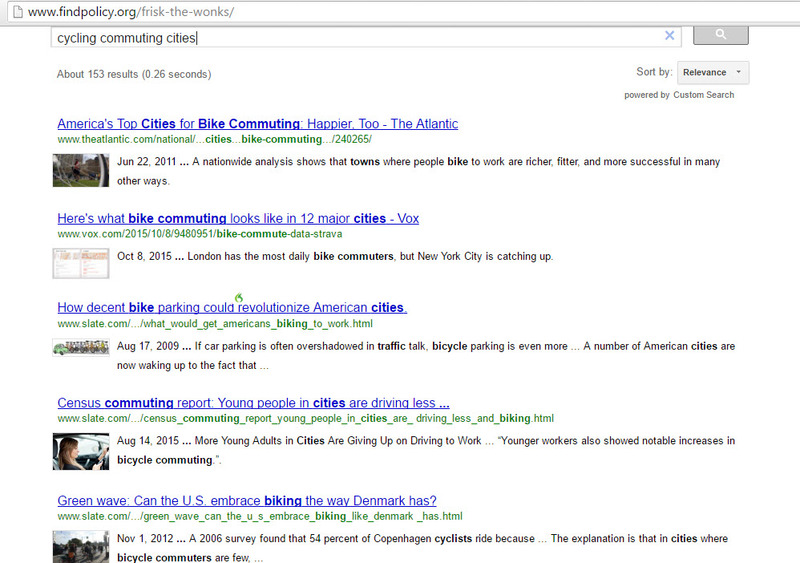 The search page also covers the outlets which Matt Yglesias and Ezra Klein previously wrote for. Accurate search terms and toggling for date can be useful, to get the best results. Note that again this is not perfect as a search tool -- but it still gets you widely cited commentators and outlets in a single search window. Want to check it out? Go here.